October was more than hectic. There was lots of fun stuff, some amazing food, two events I am really proud of and an unfortunate health scare. I had an amazing lunch at La Petite Maison, one of the very best restaurants in Dubai-which incidentally is right next to my office. It was a celebration of the completion of an important work project and the food and company were divine. I am so lucky to work with such amazing people! 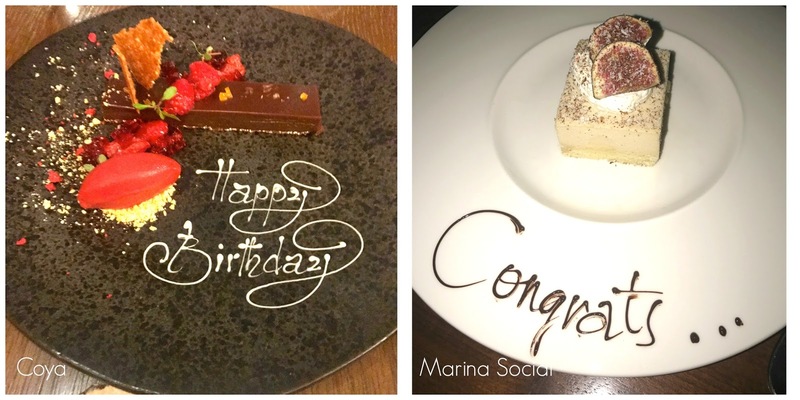 To celebrate being awarded his Fellowship, we hit another of my favourites and I took him to Marina Social where we had a wonderfully warm welcome from Tim and his team. The food was top notch-definitely try the new apple crumble cheesecake-it's amazingly crafted as well as tasting incredible! 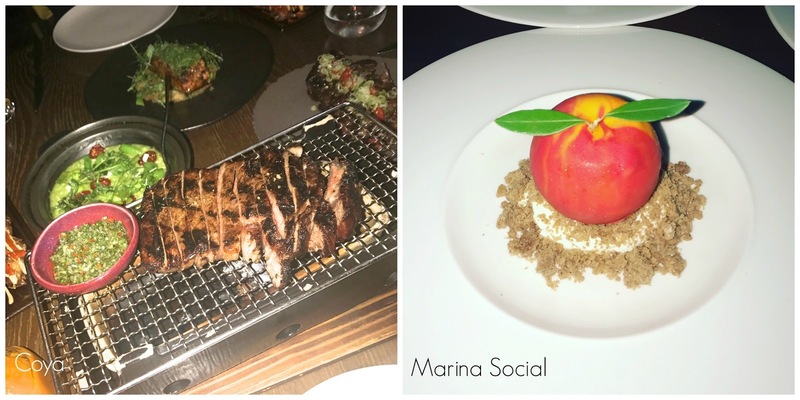 The meat dishes are also amazing at Marina Social-and the chicken leg agnolotti is just insanely good. 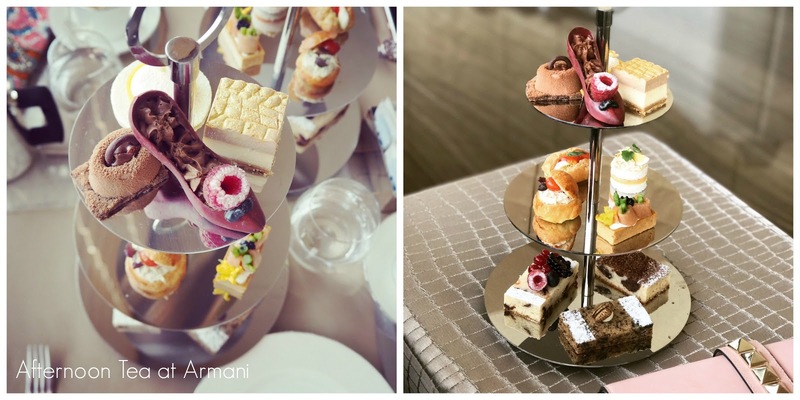 I was invited to try the Fashion themed afternoon tea at Armani and so Kirsty and I dressed up and ate cake! I've written a full review here-the Fashion theme for October has now become a Gold theme for November. I'd highly recommend trying it out and it's very reasonably priced. 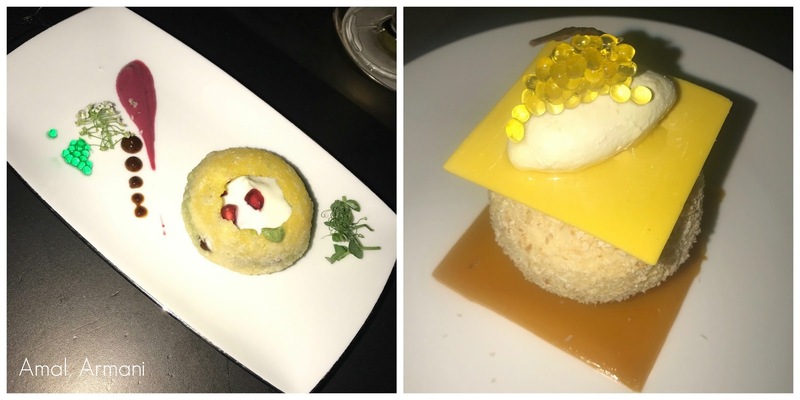 I dined for a second time at Armani, this time a much-needed girls night with Chloe and Becky from my office at Amal, the Indian restaurant. 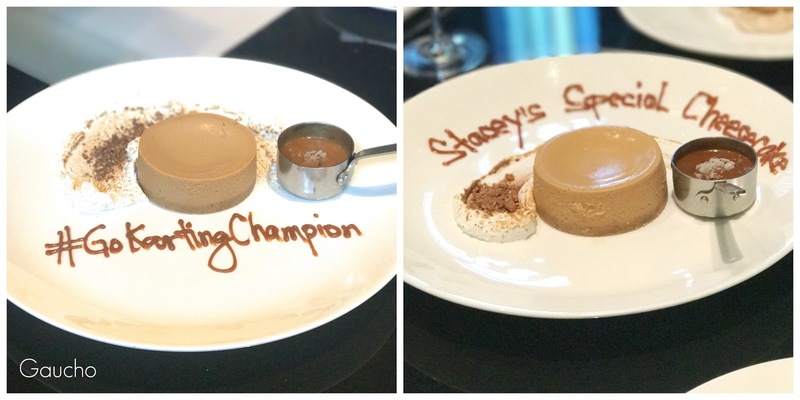 The food and service were exceptional and for the first time since the summer we were able to sit on the amazing terrace for the most incredible view of the fountains. Thanks to Becky and Chloe for helping me out/calming me down when my nerves were a bit fraught! 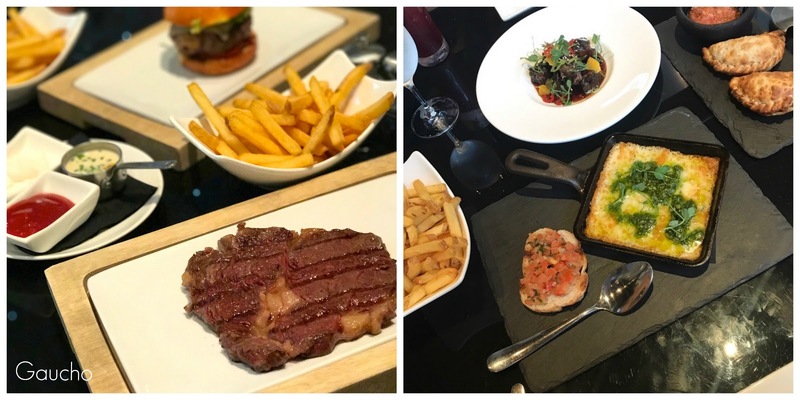 I managed to squeeze in four visits to Gaucho in October-the addiction is real! Someone even asked me if I ate there for free...I don't but that's the dream people! #SponsoredByGaucho. Four visits means 4 Dulce De Leche cheesecakes and again, the service and food is beyond amazing. I'll be starting November by attending the opening of their newly revamped terrace and I cannot wait! I know Danny the General Manager has worked incredibly hard on the new terrace and it will be amazing! I also love the fact that my Instagram followers message me when they have been to Gaucho too! 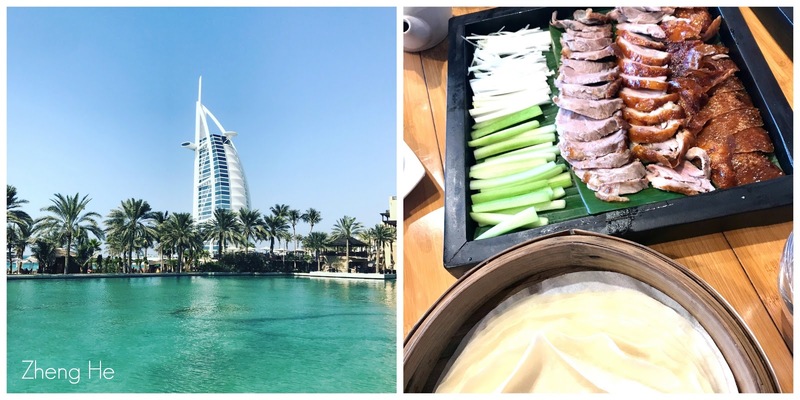 One of my favourite new discoveries in October was Hakkasan in the Emirates Towers and I loved it so much I went twice. The restaurant is dark and intimate and has an incredible bar. 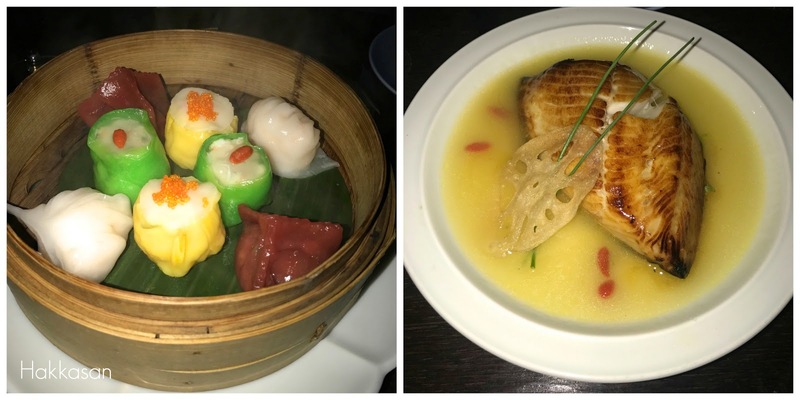 The dim sum is one of the best I have had in Dubai and the black cod in champagne sauce was to die for. The desserts were unexpectedly good. I can see my returning again and again and I am dying to try the Friday Brunch. The fact that it's in the same location as my favourite club, La Cantine, is an added bonus. One of the things I enjoyed doing most this month was catching up with Laura over a few glasses of wine at the Siddhartha Lounge at Grosvenor House. It was just about the perfect temperature to sit outside and this lounge has seriously cool terraced seating overlooking the Palm and the Marina. We only ordered chips and focused on the wine and Laura also had shisha. It was a wonderfully relaxed evening and I can't wait to do it again! 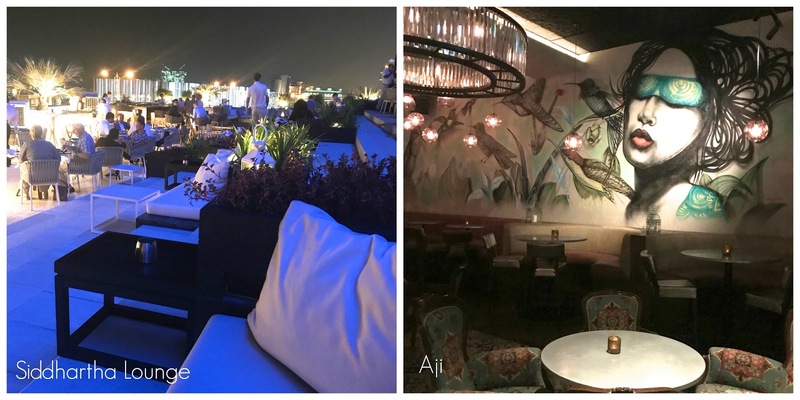 The most disappointing meal of the month was at Aji on the Palm. I had heard such good things about this restaurant but we went on a Friday night expecting it to be packed and have an amazing atmosphere (I was expecting Coya vibes) but it was empty and the waiter we had was seemingly in the worst mood ever. I couldn't raise a smile from him and the food was mediocre at best. My friends actively disliked two of the dishes and we all hated the desserts. I rated it a 3/10. I've heard they do a very popular ladies night midweek but their weekend game was weak. I had lunch at Zheng He which is another fantastic Asian restaurant and look at the view! Dubai has just become perfect-I absolutely love this time of year! The food was amazing and I highly recommend this restaurant if you are vegetarian as they have a specific menu and they do a literally amazing, vegetarian version of crispy duck! Pictured is the actual real crispy duck-it's a show in itself having it intricately carved at the table. The staff are also incredibly knowledgeable about the food. I cannot wait to go here again. 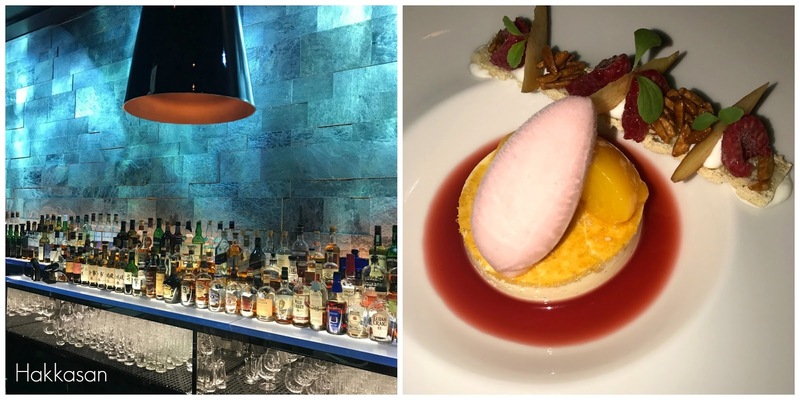 Zuma-I went for the business lunch and it was exceptional. I also had reservations there for last Thursday but sadly had to cancel as I was in hospital! I will re-book asap! Cipriani-another very very disappointing meal. I think this restaurant in DIFC is over-hyped and over-priced. 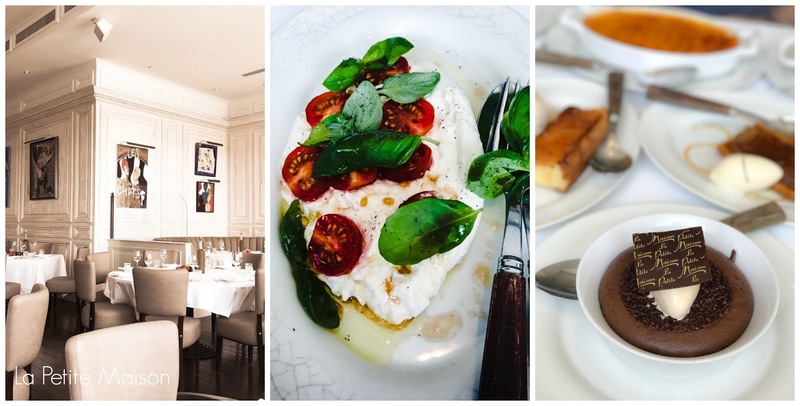 It was heaving the night we went and attracts an 'important business people' type crowd but for Italian food, I would hands down go to Roberto's or La Petite Maison in the DIFC over Cipriani. Maison Mathis-this was a fun night, again with Kirsty. We went for the ladies night and put the world to rights over plenty of wine. For AED195 they do a set 3 course meal and 500ml of wine which I thought was amazing value. I'll definitely be going again-it's literally my local and is right on my doorstep! The Halloween decor was top notch as well! The thing I am most proud of doing, possibly this whole year is hosting a cancer awareness dinner for Standard Chartered last week. The picture above shows the preparations for my talk-ably assisted by Fizzy! I don't have any pictures of the night sadly but it was truly a wonderful evening. I was approached by Claire who works for Standard Chartered and asked if I would share my own personal story. Claire and I have followed each other for years but this was the first time we had met which was fantastic and long overdue! I've never done anything like this before and getting to the point of being able to stand up and talk for 45 minutes about the last 3 years and the journey I have been on was quite the emotional roller coaster. Hence the need for a pep talk from Chloe and Becky a couple of days before the dinner. I also read old blog posts, laughed and cried and reminisced with people who have been part of that journey to formulate my 'story'. I was nervous but the ladies at the dinner were all so kind, so engaged and so friendly that by the time I got up to tell my story I just went for it. I think I spoke really well, I didn't forget anything or stumble over my words and they laughed at my jokes! The ladies were incredibly kind and generous with their feedback after the talk and it boosted my self esteem no end. Thank you to all the ladies who came! I went karting with my friend last weekend at Dubai Autodrome. I never talk about this on my blog but I have a motorsports background/upbringing. My parents run a kart track in the UK which is an amazing facility (shameless plug for Cumbria Kart Racing Club), my dad was a multiple award winning rally driver and both my brother and I both raced karts to a very high level. I 'retired' when I was 17-I wanted to focus on school and having been in that hugely competitive environment since the age of 8 I found the pressure quite hard to cope with, even though I was really good! The picture above is from when I was British champion at around age 15/16. It's been about 15 years since I have been karting but it was very much like riding a bike and it turns out I was much better than I expected to be! Apparently there's going to be a re-match between my friend and I next weekend-to be fair he knew my past and what he was getting into but we're both so into cars/motorsport that it's such good fun! Not something I really want to focus on here or dwell on because I am dealing with it but I have been a little bit sick in October. At the beginning of the month, I saw my doctor because I was really struggling with over-production of adrenaline and I was literally shaking all the time and just a few days ago I was admitted to hospital with severe abdominal pain on the left side. Given my history I have to say that Dubai London Clinic treat me exceptionally well-I'm seen immediately, prioritised, results pushed through quickly and both Dr Rajesh and Dr Anna, my key doctors, pushed patients to see me. I am incredibly grateful for the care they show. Everyone is telling me to slow down and rest-and I might address my thoughts on that in another blog post. For now, I am on the mend and back to business as usual. To cheer myself up I had a little splurge in Sephora and look forward to sharing my thoughts on what I picked up-especially the Huda Beauty foundation soon! 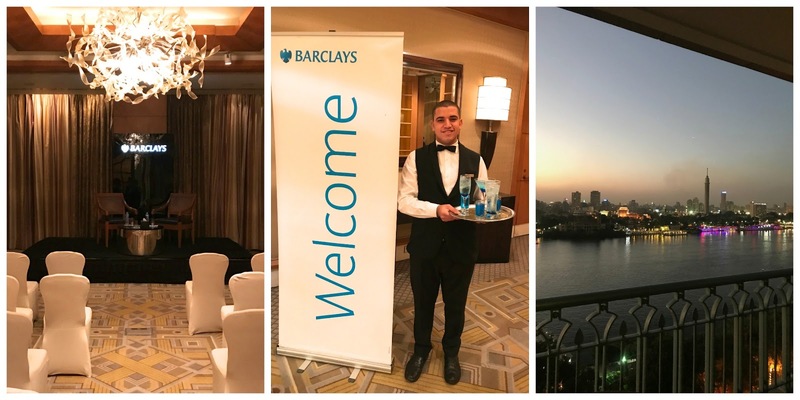 Another event I am super proud of, Raj and I hosted an event in Cairo with our Global Director of Research and Investments, Henk Potts for 45 of my Egyptian clients. The event was done in a 'Michael Parkinson' interview style where for an hour I asked our Henk various questions about the global economy. It was so well received by our clients and I was really proud of myself because I knew I did a brilliant job. Raj keeps joking he is going to lose me to CNN! The reality is I really really enjoyed doing it and I've had a real confidence boost this month by doing this and the Cancer Awareness dinner. Straight after the event Raj and I had to head to the airport as we were on the overnight flight back to Dubai. By some miracle, as we were boarding the plane, both Raj and I were upgraded by Emirates to First Class. We honestly couldn't believe it-it was the perfect way to end the day. 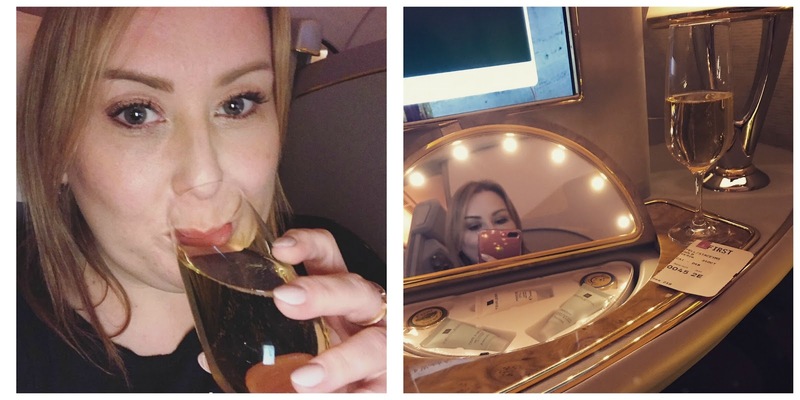 I think we were like two kids in a sweetshop-Emirates First Class suites really are next level. I think I pressed all the buttons in the suite and ate a four course meal at 3am! I drank Bollinger and thoroughly enjoyed every single second of the experience! So that's October! I genuinely think that had to be the busiest month of the year. It cannot possibly get busier....can it?